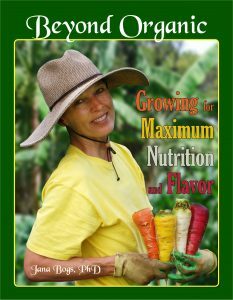 Dragonfly Ranch in Honaunau will be hosting a Nutrition Farming for Hawaii presentation by Dr. Jana Bogs this Saturday, December 8. 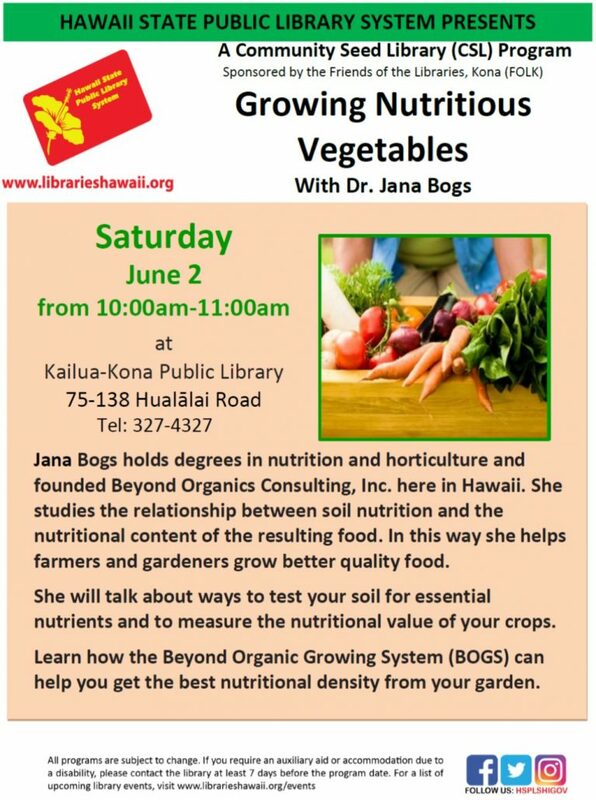 Dr. Bogs will be explaining why and how growing our food in an optimized way, can double or triple the nutrient content—as well as improve the taste of our vegetables. 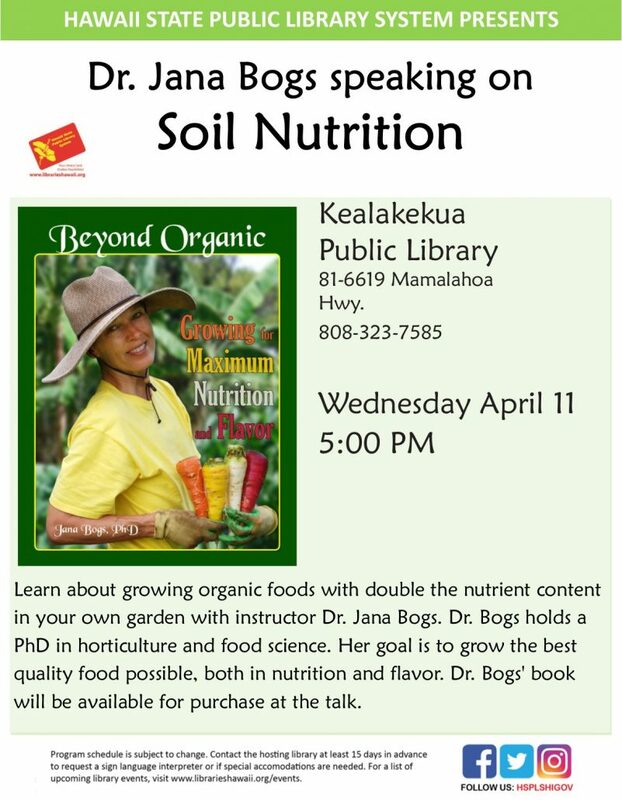 She will be speaking especially to people who have a passion for the `Aina (Hawaiian for “the land which feeds us”). This is an educational experience for students, gardeners, farmers, and others who wish to learn about Nutrition Grown™ food production. Questions welcomed! Nutrition Farming for Hawaii (NFH) is a grant-funded research and demonstration outreach project. It is bringing more nutritious food to our community through an optimized, environmentally-friendly growing system . 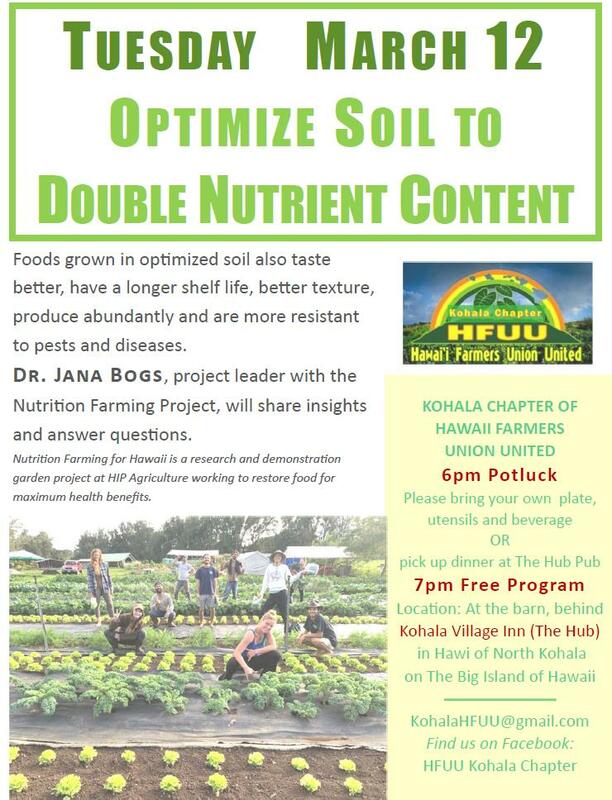 Nutrition Farming for Hawaii was started by project director, Dr. Bogs, with the aim of conducting research on improving the nutritional qualities, flavor, and yields of food crops starting from the soil up. 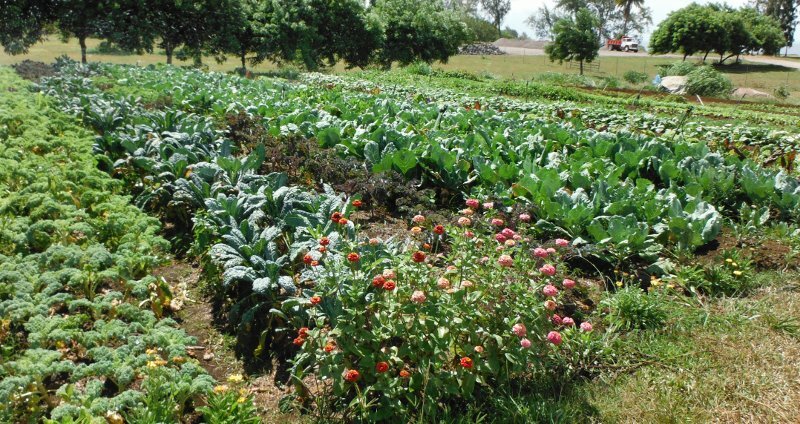 The project mission is to improve human health and raise ecological awareness by instituting a paradigm shift in food cultivation practices which produce high yields of delicious, nutritionally-optimal foods. 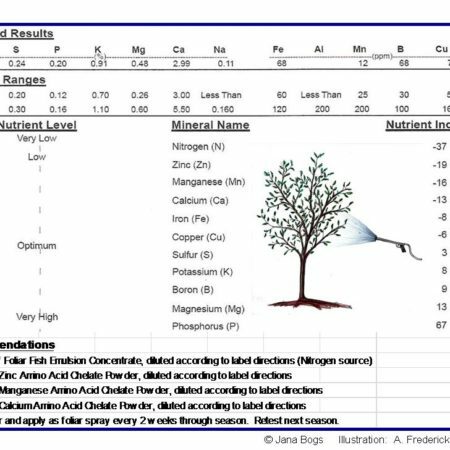 Dr. Bogs will be presenting her data regarding soil and crops that show large increases in food nutrient content as compared to USDA values. Dr Bogs offers comprehensive laboratory testing of soil and plant tissue, which provide a detailed interpretation to determine what organic-type fertilizers, beneficial microorganisms, and foliar spray nutrients the soil and plants need. In turn, these plants produce the most nutrient-rich, health-promoting foods possible. Furthermore, Dr. Bogs teaches an in-depth online course called Perfect Soil. Learn more at https://beyondorganicresearch.com/course/. As part of the outreach effort, Dr. Bogs will be presenting this slide show for free at the Dragonfly Ranch in Honaunau on December 8th at 6:30 pm. Come learn more about the project and how you too can grow your own amazing foods! Contact Barbara Moore at (808) 238-2159 for directions or see the map at www.dragonflyranch.com. Guests are invited to come early to tour the five bedroom B&B. There is a colorful labyrinth for a meditative walk while viewing the sunset over the South Kona Coast. It’s almost time for the Nuts Festival! Always a fun time! And it’s FREE! Sunday, November 18, 10 am to 5 pm. Click here to see more info. 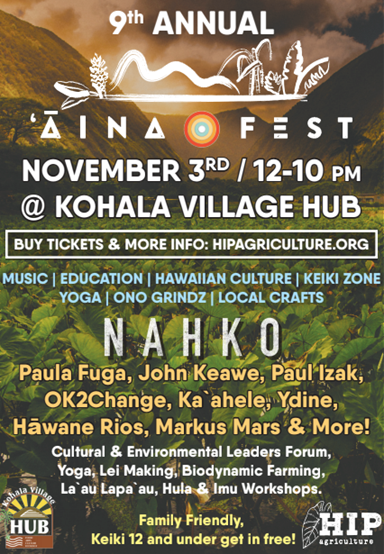 WHAT: Hawai’i Institute of Pacific Agriculture’s 9th Annual ‘Aina Fest! Presenting world-renowned musicians, agricultural and Hawaiian cultural workshops, yoga classes, Keiki Zone, hula performance, local organizations working to protect, preserve and enrich our communities and ono food, drink and crafts from local vendors, ‘Āina Fest 2018 offers something for everyone. This year’s live music will be performed on two different stages. The line-up features Nahko (frontman for Medicine For The People), Paula Fuga, Paul Izak, John Keawe, OK2Change, Ka‘ahele, Hāwane Rios, Ydine, Markus Mars and more! General Admission tickets are $50 in advance and $60 at the gate. Keiki aged 12 and younger get in free. All entertainment, educational workshops and keiki activities are included in the ticket price. WHERE: At the Kohala Village HUB Barn & Surrounding Grassy Fields. 55-514 Hawi Rd., Hawi, HI 96719. 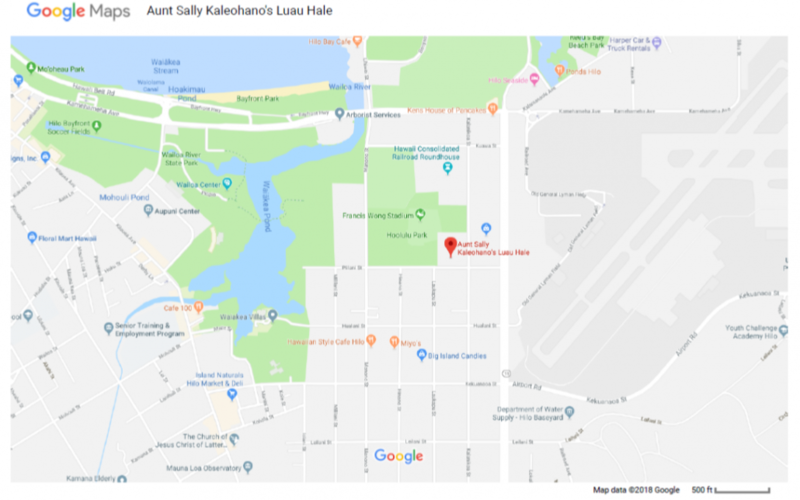 Please check http://hipagriculture.org/aina-fest for a detailed parking map which will be posted prior to the event. WHEN: Saturday November 3rd, 2018 from 12-10pm. Gates open at 11:30am. 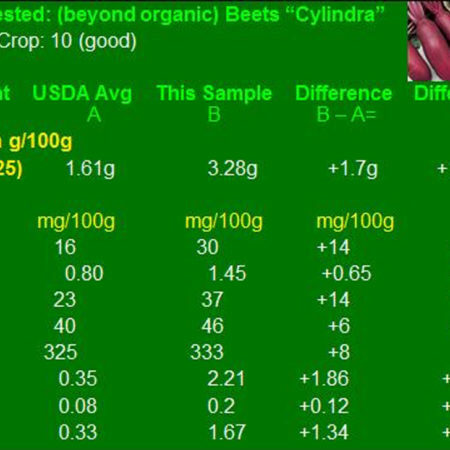 http://beyondorganicresearch.com/wp-content/uploads/2017/06/bor-logo.jpg 0 0 Dr. Jana Bogs http://beyondorganicresearch.com/wp-content/uploads/2017/06/bor-logo.jpg Dr. Jana Bogs2018-10-27 17:18:532018-10-27 17:26:34`Aina Fest Invitation--Next Saturday--November 3rd!